2Thinly slice half of the lemon into rounds and set aside remaining half. 3Toss the sliced lemon rounds, smashed garlic cloves and broccolini with olive oil and season with salt and pepper. Layer onto a rimmed baking sheet and sprinkle broccolini with nutritional yeast. 4Roast in preheated oven for 10-15 minutes or until the broccolini is bright green and starting to char. 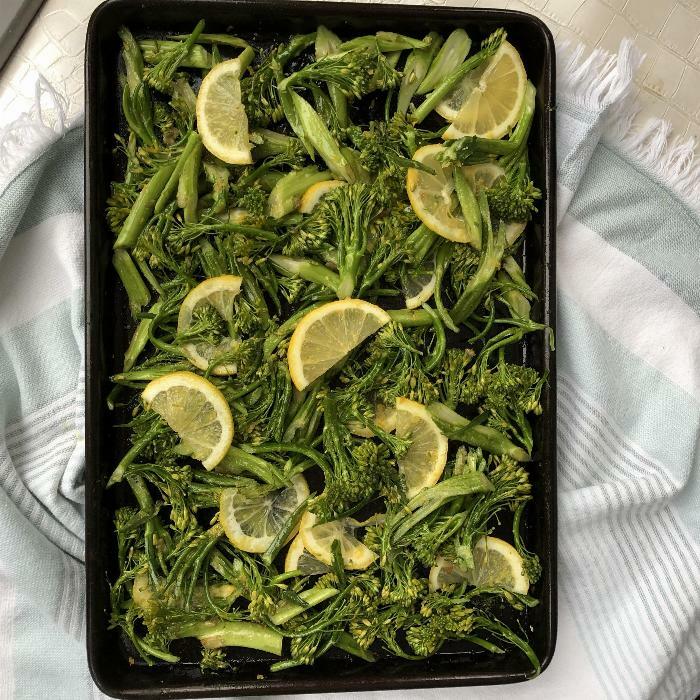 5Remove baking sheet from oven, squeeze the remaining half of the lemon over top of the broccolini (optional) toss and serve. Nutritional yeast is a source of B12 and a great option for people who do not consume dairy or dislike cheese. You can use parmesan instead of nutritional yeast if you are a cheese eater.